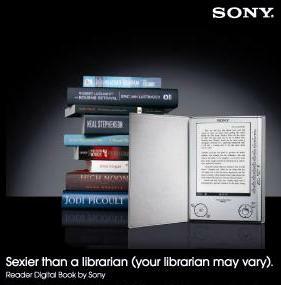 Library Mistress: Sony: "Sexier than a librarian (your librarian may vary)"
Sony: "Sexier than a librarian (your librarian may vary)"
Die Werbung für den neuen eBook-Reader von Sony stieß anscheinend auf geteilte Zustimmung, liest man im Sony-Blog: "Please be assured that this was a tongue and cheek effort on our part, playing off a certain stereotype or a fantasy, depending on how you look at it. With a little humor in mind, our aim was to draw attention to the style and the appeal of this unique device. The ad was never meant to be taken literally". Ich mag den Zusatz "your librarian may vary".